When I last left our travels it was the end of November or Mo’vember and the Moustache was in grand fashion. I had planned on shaving before we left for Marrakesh but I ran out of time. Admittedly I probably could have made time, just didn’t. Fast-forward into our trip, all was normal until we stopped to ask a young man for directions. He says with a chuckle, “Ooohh Mr. Moostache!” Ok, so that settles it the moustache was going the next morning. However before it met its fate it provided one last picture as you can see, one that will surely prove to give me grief in the years to come. 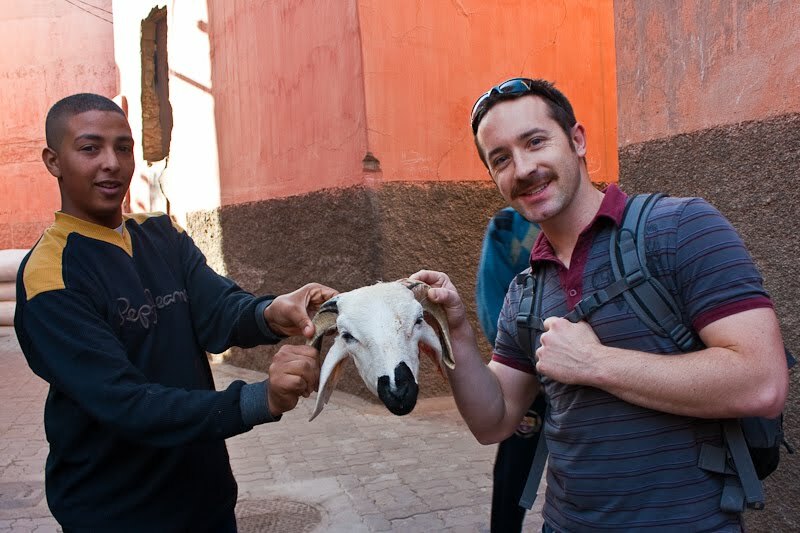 Weirdly I’m smiling in it too… More on the sheep head later. Now let me rewind the story. Landing in Marrakesh we got the full Moroccan experience meeting our riad manager at the airport then jumping into a taxi. No yellow or black cab here. It was a gold 1980’s-ish diesel Mercedes Benz. Muffler dragging, new steering wheel, new gear shifter knob, seat covers, the works! Windows open, we cruised through the streets in proper African style around donkey’s pulling carts, mopeds driving wildly carrying entire families, while honking every 10 seconds and driving in the middle of the road. Welcome back to Africa …I love it! 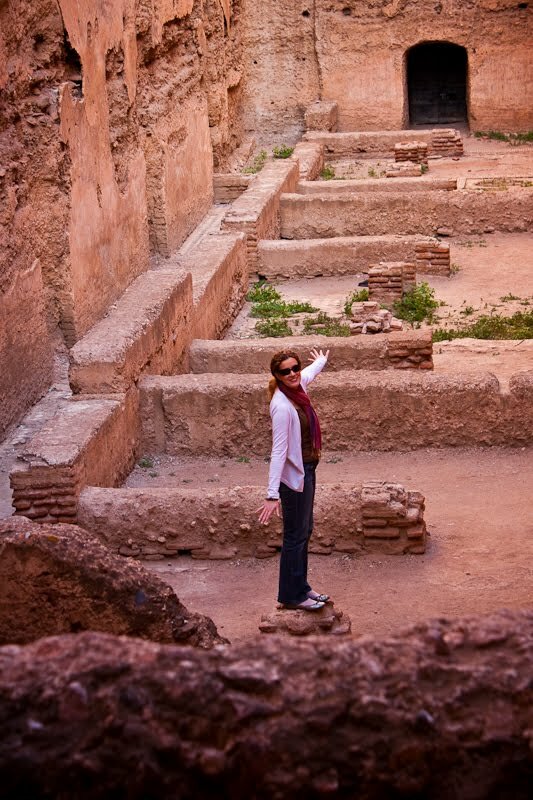 We got out of the taxi on a wide city street then were guided by our riad manager into the center of the historic district with its maze of streets and passages. Down a few small alleyways we came to a beautiful wooden door that opened to our riad. These are the Morroccan version of hotels. Big lavish homes turned into accommodation. They tend to be more full service compared to hotels having a few rooms but giving a more quaint experience. Ours was multi-story, with a small pool in the center open to the elements. We were lucky enough to get a room with a balcony of sorts overlooking the pool. 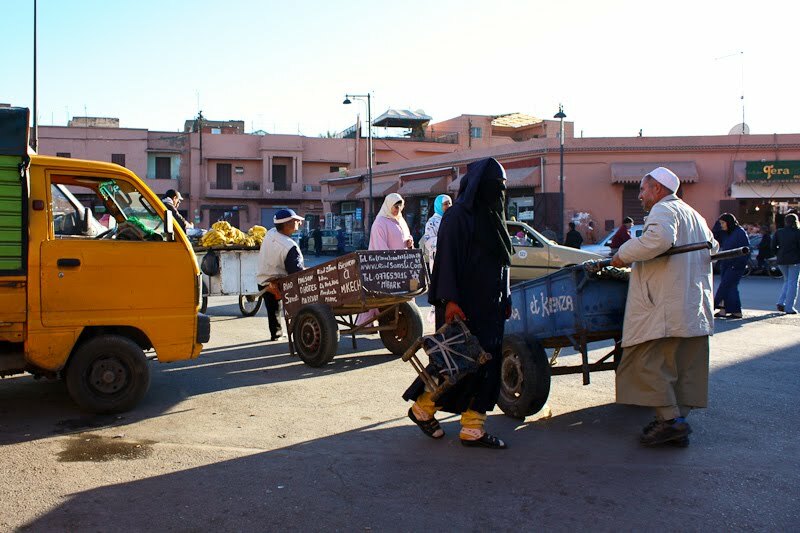 In Morocco, the 2 main languages are Arabic and French, neither of which we knew. Our riad owner happened to be the later, which made communication a little easier than if it’d been in Arabic. After dropping our luggage and enjoying our first of many Moroccan mint teas, we headed out to the streets to explore. Quickly we noticed something strange was going on. It seemed around every corner was an old mattress frame on fire. Around it were young men tending the fire and roasting sheep heads. Yes, you read that right. Hopefully the picture makes more sense now because we ran into a guy on his way to the local fire and stopped him for the picture. From what we could gather we were in the midst of a religious festival called The Day of Sacrifice. Evidently one of the traditions is cooking and eating the brain of the sheep. The heads were burnt on the fire and then the flesh and hair was scraped off. What happens next we aren’t sure? 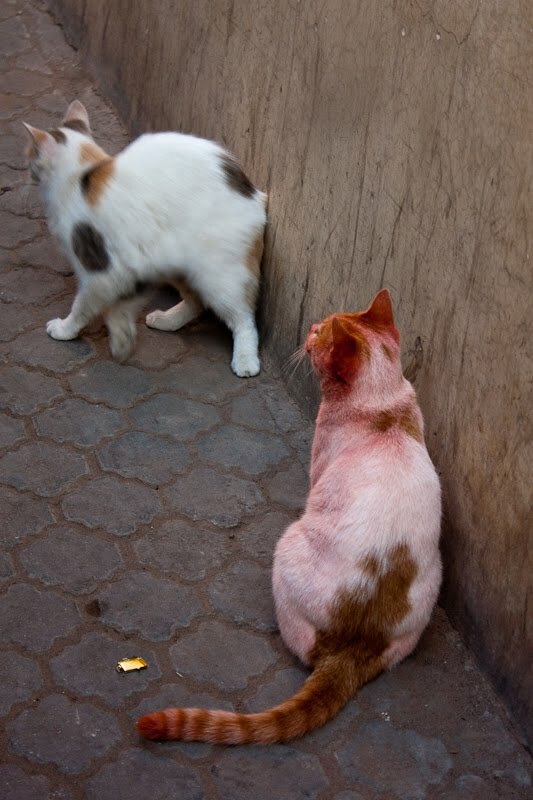 In addition to the fires, we saw a few big piles of sheepskins and even a pink cat that had found a nice dinner somewhere…hence being covered in blood. Interesting to say the least. The link above is worth a read for more background on the reasons for the festival because I’ll agree it is a little odd and that gives it some justification. 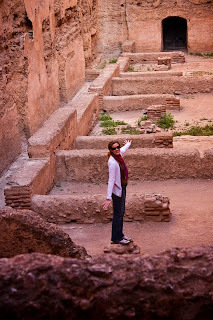 We did some other touring including some old palaces and saadian tombs which were interesting. Finally to wrap up the day we had a traditional tagine dinner with a belly dancing show and we were beat!